A formerly distressed North Miami Beach apartment complex recently reopened after undergoing an $8 million redevelopment process led by nonprofit affordable housing developers Carrfour Supportive Housing and the National Housing Trust. The redevelopment of Harvard House Apartments was made possible through support from the U.S. Department of Housing and Urban Development’s (HUD) Neighborhood Stabilization Program (NSP), which aims to revitalize neighborhoods that have been negatively impacted by properties that were foreclosed upon or abandoned as a result of the recession. 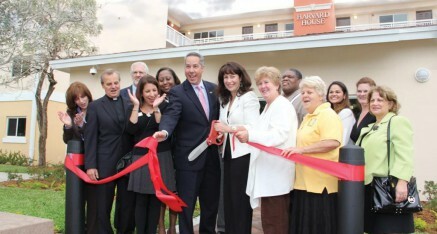 The reopening was celebrated on March 19, when developers Carrfour and NHT organized a special reception and ribbon-cutting attended by several elected and non-elected government officials, including NSP Team Leader John Laswick of the U.S. HUD Office in Washington, North Miami Beach Mayor George Vallejo, and Miami-Dade County Commissioner Sally A. Heyman. The newly redeveloped community will now offer affordable housing to approximately 140 low-income residents. Located at 2020 NE 169th St. in North Miami Beach, the apartment community consists of 56 newly-renovated units designated for families earning at or below 50 percent of the area’s median income. Carrfour Supportive Housing, the non-profit developer that rescued Harvard House from foreclosure and redeveloped it, has completed the acquisition of two similar complexes in Miami. The two projects—Tequesta Knoll and Hampton Village—will also be delivered to the market by 2014, with all three newly converted affordable housing communities offering homes for nearly 800 low-income residents in the area.